Swollen joints, knees and ankles after running can be caused by a number of different issues, which means that the road to healing may be different for everyone. In most cases, fluid collecting around the ankle and knee joints may be to blame. Before calling the doctor, there are a few different at-home treatments that you can try and methods of prevention to help you avoid experiencing a recurrence of the issue. In some cases, swollen ankles and knees after running may be due to a sprain or a torn ligament incurred during performance of the exercise. In other cases, inflammation of an old ankle or knee injury can cause swelling after running. Likewise, edema, the collection of water around the joint, may be the problem. 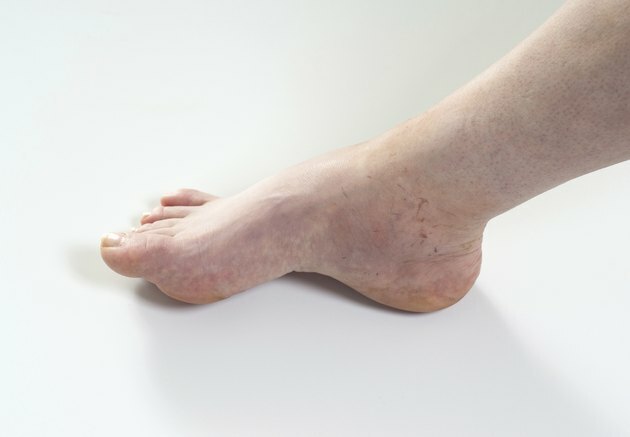 Swollen ankles and knees can make the joints stiff and make it difficult to perform certain tasks like walking, or even standing, without pain. You may notice a swelling around the joint, reddened skin in the area, pain or discomfort, and an unsteady gait as you attempt to run or walk. If you experience swollen knees or ankles, other joints may begin to fatigue more quickly as they overcompensate to make up for the malfunctioning ankle or knee joints. Depending upon your experience of pain, you may not need to head straight to the doctor for a swollen knee or ankle after running. Start by icing the ankle or knee for 20 minutes at a time; this should reduce both the pain and inflammation associated with the swollen joint. After each icing, apply heat to the injured area for 20 minutes; this should increase circulation and the rate of healing. Additionally, if you are experiencing pain continually, you can take over the counter pain or anti-inflammatory medications. Preventing swollen knees and ankles due to running starts with a five to 10 minute warm-up before you begin running. Stretch the hamstrings, quads, calves, and ankles to increase blood flow to the muscles and ligaments and decrease injury including swelling. Additionally, when you finish your run, end by stretching again to increase the range of motion of your knees and ankles and reduce the risk of injury. If pain and swelling in the knees and ankles after running does not go away with at-home icing, heat packs, and rest after three days, consult with your doctor. In the event that a ligament tear or other severe injury is to blame, you may need more intense medical treatment. If you feel significant pain or find that it is impossible to bear weight on the injured leg, see your doctor.